It is a great honor for us to announce that our company, REZOS BRANDS SA, has been awarded for the project idea “Hippocrates Farm” in the framework of Accelerator “KATANA” program. KATANA is a project financed through the H2020 INNOSUP-1-2015 call “Cluster facilitated projects for new value chains” which supports European SMEs in the agrifood value chain to simultaneously access knowledge, technology, capital and markets in order to respond to the global competitive environment. Initially, 640 ideas were submitted while each consortium proposed one product/service from one of the following categories: Precision Agriculture Services, Mobile Services and Functional Foods. The top 100 innovative ideas where selected and during the 3-days on-site Bootcamp process (in Stuttgart 7-9 July 2017), in the presence of other candidates, market players, investors and the evaluating committee, the top 10 of KaTaNa project ideas were selected ((3) products/services from each category that will receive the highest evaluation by the judges/coaches and the one (1) next best regardless of category (10 products/services in total). At the top 4 of the Functional Food sector was our product: Hippocrates Farm. The project “Hippocrates Farm” forms the investment of our company at the research & development of new crops, uses, production, processing process, product line which will lead to sustainable development and the vertical business model of everyday products, which will be distributed at European and international market via distribution networks. Cultivation of sea buckthorn (hippophae) and other aromatic and medical herbs as well as ecotourism and agritourism, agro-and-environmental training and volunteerism activities amongst others are taking place into an energy-independent environment, in complete harmony with nature. Rezos Brands “Hippocrates Farm” is a product line based on biological sea buckthorn, cultivated in our own farm at Meteora; this project is aiming to promote hippophae, as the top Greek superfood with unique beneficial attributes for the human being. Rezos Brands has already developed a range of products based in the osmotic process of fruits which preserves the multiple benefits of hippophae, while at the same time gives a pleasant taste to the final product. 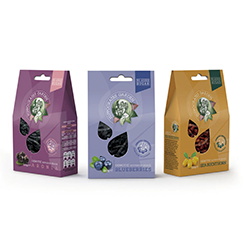 The Hippocrates Farm product line, which is already on the Greek market, includes osmotic hippophae, osmotic hippophae juice and hippophae with black chocolate coating. This award, consist a great success as it is the only Greek participation which was evaluated in a such high ranking at the top 10 products at the KATANA Stuttgart Boot camp and won a place into the Heidelberg Innovation Forum, an Annually European initiative, organized in Germany. 9.2017 the preparation of marketing campaign for boost awareness & follower’s interest.